You'll be £25.00 closer to your next £10.00 credit when you purchase Somme Campaign. What's this? The five and a half month long Somme campaign in the summer and autumn of 1916 was a defining moment in the history of the British Army. From the disastrous opening day on 1 July to the final attacks in November, each large battle and minor action is given equal treatment inside these pages. The book concentrates on the British Army's repeated efforts to first break through the enemy lines,and then to wear down the German in a bloody war of attrition. By compiling information from the Official History and the printed histories we get a balanced view of the most talked about side of the campaign, the British side. You will find plenty of information on the reasoning behind each battle and the objectives. There is discussion on artillery bombardments, tactics, zero hours, the terrain and insights into the successes and failures of each attack. Over ninety new maps chart the day by day progress of Fourth and the Reserve Armyacross the rolling chalk downs of the Somme. Together the narrative and mapsprovide an insight into the British Army's learning curve during that fateful summer; a learning curve which set the scene for future battles on the Western Front. We can see the hard lessons learnt and the solutions used to solve a multitude of problems, from communication and all arms co-operation, to the inclusion of tanks and the growing role of the Royal Flying Corps. Where possible the men who made a difference are mentioned; the men who lead the assault companies and bombing teams, those who cut the wire and led the survivors into the German trenches, those who stopped the counterattacks and those awarded the Victoria Cross. Discover the real Somme campaign fought by the British Army and learn how its brave soldiers fought hard to achieve their objectives. Thanks to Andrew Rawson once more for another great book which provides not only a very useful guide to the battle, but doubles up as a great guide for battlefield visit. Of the hundreds of titles that have been published about the Somme since it came to an end in the muddy wastelands of the Transloy ridge and Ancre heights in late 1916, relatively few have provided a continuous narrative of the whole battle. 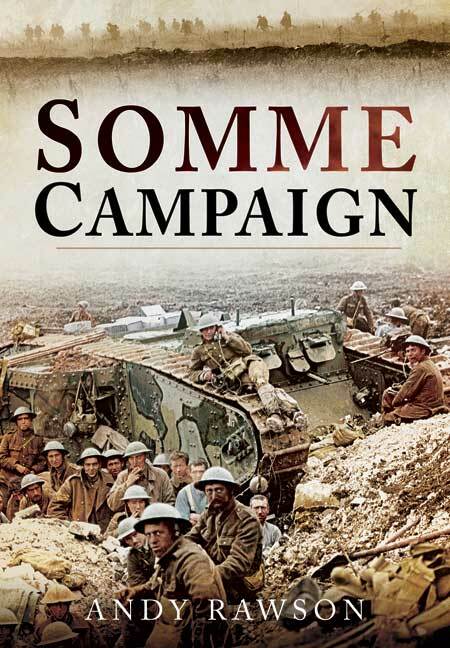 There is a little-covered space between high-level summary of the campaign and the detail of the doings of a particular unit or individual – and Rawson’s “The Somme campaign” fits right into this space. It provides us with a well written narrative of the progress of the battle, from the opening artillery bombardment in late June up to the end of fighting in November. Drawing heavily upon secondary sources, notably the British Official History, it deals with the military campaign and leaves out the politics behind the battle. The fighting is described at a divisional / brigade / battalion level and does not (with a few exceptions) mention individuals. We learn of the reasons why the various elements of the battle proceeded as they did, from high command decisions to the terrain and the weather, for example. As such, it is a useful summary of the battle; almost a “ready reckoner” that would quickly guide an interested reader to a particular date, place and unit, and from which that reader could go on to more detailed reading from other sources. Each phase of the battle is also described with some good, clear maps: these are taken from the official and other histories and are overlaid with symbols to indicate the relevant front lines and formations. “The Somme campaign” does have its limitations, in that it only presents the British part of the battle. Virtually every British and Commonwealth infantry unit that participated gets a mention somewhere, whereas the Germans and French are more or less absent except en masse. As the author explains in his introduction, it is a difficult task to “pitch” such a book at an appropriate level of detail and a truly comprehensive work would be quite a tome. It would, of course, also require a great deal more work in drawing the French and German side of things into the picture. As such, “The Somme campaign” is a good read and a useful work of reference, if only to point the way to more detailed studies and primary sources of information. The author takes the view that the five and a half month long Somme campaign in the summer and autumn of 1916 was a defining moment in the history of the British army. From the disastrous opening day on 1st July to the final attacks in November, he gives equal treatment to each large and minor action of the campaign, fought over the rolling chalk downs of the River Somme. His new book concentrates on the British army’s repeated efforts to first break through the German lines and then to wear down the enemy in a war of attrition. This brought about a ‘learning curve’ for the British army which arguably set the scene for future battles on the Western Front. By compiling information from the Official History and printed histories the author presents a balanced view of the British side of the campaign. Such aspects as artillery bombardments, zero hours, all arms co-ordination, the introduction of tanks, the role of the Royal Flying Corps, the hard lessons learnt and the solutions used to solve a number of problems, as well as the terrain, are all discussed, along with insights into the successes and failures of each assault by the Fourth and Reserve Armies, all of which are presented in a very readable style. More than 90 new maps, plus 16 monochrome images support and illustrate the text. The author’s conclusions, a suggested reading list and a comprehensive index round off this most informative book. Lavishly illustrated with b&w maps of the action, this book tells the lesser known stories of the entire campaign, where Allied soldiers fought for weeks to accomplish their objectives. This authoritative, first rate book, brings together in one work the full story of the Somme campaign from beginning to end, allowing equal space for every battle and minor action. Here, the author has skilfully woven the threads together to provide a very engaging and easy to read narrative which not only provides an immense sense of scale but which brings home the enormity and sheer weight of expectation of what is was hoped would be achieved. If you want to add a book to your collection which will provide you with surely the most comprehensive account of the Somme campaign, then this has to be the one. No Somme library is complete without this book and I cannot recommend it enough. Rawson delves into every aspect of the campaign, compiling information from various sources to discover the reasons behind each battle and the bloody consequences for all involved. Andrew Rawson is a freelance writer who has written over twenty-five military history books. He has written eight books for Pen & Sword’s ‘Battleground Europe’ series and three reference books for The History Press ‘Handbook’ series. He has edited Eyes Only: The Top Secret Correspondence between Marshall and Eisenhower and Organizing Victory: The War Conferences 1941–1945. He has also written a campaign volume of the British Army’s battles in 1914, 1915 and 1916. He has a master’s degree with Birmingham University’s history department. Andrew lives in Mallorca, Spain.